The residents of Lviv are looking forward to the premiere of Oles Yanchuk’s motion picture, The Unconquered, about Roman Shukhevych (Chuprynka), Commander-in- Chief of the Ukrainian Insurgent Army (UPA). The film is topical even more so in the context of past as well as current political realities. In addition, Shukhevych’s widow Natalka, his children Mariya and Yuri, a grandson and granddaughter also live there. 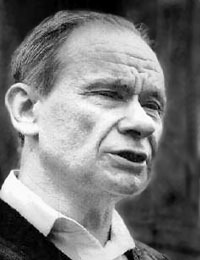 Yuri SHUKHEVYCH is a politician and describes himself as a freelanc pragmatist. He was the film director’s consultant. The Day: Mr. Shukhevych, isn’t it heartwarming to know that the ice has been broken? UPA is still to be recognized as a combatant, but this is just a matter of time. 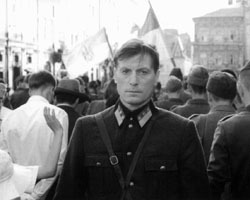 The movie was shown to an SRO audience at the Cinema House in Kyiv, and this is vivid evidence of public interest in your father as a national hero. What do you think of Oles Yanchuk’s production as a politician? Y. S.: Oles Yanchuk read me the script and asked for my advice, then made some corrections. However, I could not convince him that in such productions one should not be afraid to show the insurgents’ ruthless treatment of the enemy. Every struggle has its logic. If it is cruel, one must show it that way; making such characters soft-hearted means resorting to falsehood, stepping away from historical truth. The Day: Even our national anthem reads that we will sacrifice our body and soul for our freedom. Y. S.: Over the ten years of independence we have been assured that we should rejoice at not having bloodshed in our territory. However, national freedom and dignity must be defended, if need be with blood. As it is, we appear prepared to be slaves without honor and dignity, just so there is no blood spilled. What kind of independence is that? The Day: In Lviv’s political community you have the reputation of one often going against the tide. Do you identify yourself with a certain political party? Y. S.: At one time I quit the Interparty Assembly and now I am no longer a member of UNA-UNSO, because this organization has drifted away from the idea of Ukrainian nationalism. Other parties also disappoint me, because their public impact is miserable and they work only for themselves. As a pragmatist, I do not recognize enemies or friends in politics, just common interests. I understand that our country is in an unsatisfactory condition, so I am prepared to speak with whoever wants to do Ukraine something good be it a politician or civil servant, Right, Center, or Left. The Day: How do the emotional Galicians react to such a broad political range? Y. S.: They are not happy and some even say I have turned traitor to my father. The Day: What has happened to the Ukrainian Piedmont over the ten years of independence? Y. S.: I must have become tired of being one. I am ashamed to say this, being a Galician, but we are a backwater province, because our patriotism has turned into a cheap market show. Conscious, learned Galicians understand this. The Day: Are they putting up with this? Y. S.: It takes a critical mass of those refusing to put up with things, after that we could once again become Ukraine’s political Piedmont. The Day: Will self-criticism and self-irony help us accumulate this critical mass? Y. S.: They will, but we generally lack subtle self-irony, I mean what the Jews have. They are quite ironical in their own circle, but they never wash their dirty linen in public. Even if they point to their “bruised backs,” they do so to get something. We go to extremes, resort to self-castigation, complaining that we Ukrainians are poor and down-trodden. We should have more dignity! The Day: Some claim that this inferiority complex is a Ukrainian national trait. Y. S.: No, it’s not. Did my father’s generation have this complex? Some people his age are still alive. We are not talking Yaroslav the Wise. My generation is affected by this complex and the younger one is just hopeless, because this complex was inculcated by the powerful Soviet system, its propaganda, and schools. The Day: Is the situation really so tragic? Do we have some immunity against this virus? Y. S.: Each and everyone must realize that he can change his life without waiting for changes from above, believing that the state owes everybody something. Now this is what I call the herd complex. Y. S.: They certainly are. The history of the UPA is the best example of a military organization and a self- sufficient organization of the people catering for that army, supplying food, clothes, footwear, everything it needed. Regrettably, we do not know our history well enough. The Day: At one time you were Yevhen Marchuk’s campaign worker. What do you think of the current campaign against him in Galicia, the accusations of his betraying the electorate? Y. S.: I have never created any idols and nor did I see Yevhen Marchuk as an idol, unlike all those feeling so bitterly disappointed now and creating another idol, because they simply cannot live without worshipping one. I remain realistic in supporting Marchuk. I was attracted by his program and objective, bringing the nation together. This has to be done. He joined the President’s team and has now to play by its rules. Perhaps if Yevhen Marchuk’s policy were more transparent, if people had more information, they would stop accusing him of betrayal. Well, politics are like a strong wine, it can be served the people undiluted. And they would stone me if I spoke like that at a rally. I don’t want to be categorical toward anyone. It’s too bad that our people go to extremes in crowds. As for Yevhen Marchuk, he should read the Gospels carefully. On Sunday they shouted hosanna and on Thursday they yelled, crucify him. I am sure that the crowd will condemn Yuliya Tymoshenko and Viktor Yushchenko this way. All this reminds me of what happened to Ivan Dziuba. After his work Nationalism or Russification? was published they pressured him and made him recant. His associates of yesterday’s associates almost called him a traitor, despite the fact that his work had played a very positive role. I understand their reaction. To them, Dziuba was an ideal and then nothing. They felt robbed. This is the logic of those incapable of doing anything ideal themselves. Or take Masol. They stoned him using the students’ hands. They were thrown to the wolves as others their age had been at Kruty. [Where the Central Rada sent 300 cadets to face the Red Guards without the least hope in 1918 — Ed. ] Now we can understand that Masol’s successor, Fokin, has actually robbed us of our money, our savings for the benefit of Moscow. And so the students did play their tragic role. I want to write an article about this. The Day: But you were also assigned a tragic role during the elections; word was that the son of General Roman Shukhevych, currently Yevhen Marchuk’s campaign worker, was actually a KGB stool pigeon named Baltiysky. The newspaper Ukrayinsky shliakh published Baltiysky’s facsimile statement to the effect that “the road of Ukrainian nationalism leads nowhere.” It was then they threw mud on UPA General Chuprynka’s name. Are you perplexed by the Galicians not showing enough respect for your father’s memory? Y. S.: I hold no grudges. I remember someone wanted to write a play about Andriy Sheptytsky and couldn’t. One has to have a very big heart to understand the grandeur of his spirit. The same is true of my father. And our poor laborers travel to Spain or Portugal. What do they care about Shukhevych or Kruty? The Day: Still, you belong with the unconquered. You continue adding to that critical mass, along with all those refusing to put up with the herd and inferiority complexes. Thanks for your time. I hope we can meet and talk more after The Unconquered premieres in Lviv.